While Apple’s iPhone Smart Battery Cases for the iPhone XS and XR feature a lower mAh rating when compared to past versions, it appears they are actually more powerful than their predecessors. Wirecutter reports that Apple is using two battery cells wired in a series with the XS Smart Battery Case, resulting in the net amperage being the same but the voltage getting boosted to 8.7V. This is significantly higher than the 2.8V featured in older iPhone Smart Battery Cases. For comparison, the new Smart Battery Case features 10.1 Wh, the old iPhone 6 version include 7.13 Wh, and finally, the iPhone 7 model features 8.89 Wh. If this is a little too technical for your taste, you aren’t alone. However, for those interested, Wirecutter has a great write up explaining why Apple’s new Smart Battery Cases are indeed more powerful than previous versions. It remains unclear exactly how powerful the battery is in the iPhone XR version of Apple’s Smart Battery Case, though it’s likely very similar to its XS and XS Max counterpart. In other iPhone Smart Battery Case related news, it turns out the iPhone XS version of the case is compatible with Apple’s iPhone X despite earlier reports indicating that it isn’t. The iPhone XS Max and iPhone XS version of the Smart Battery Case is priced at $179 CAD and is available in White and Black. 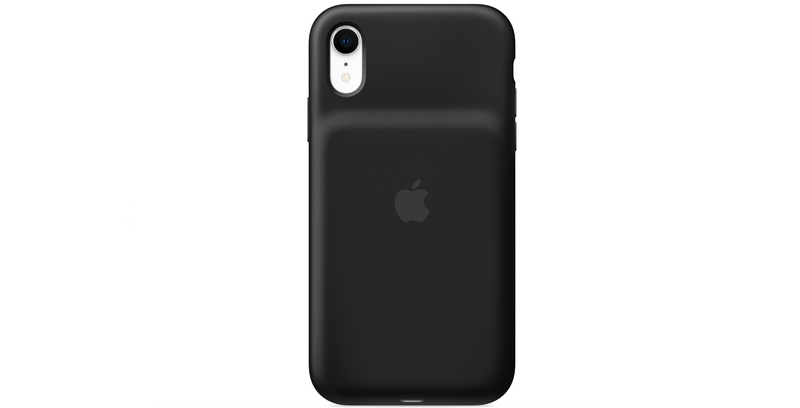 The iPhone XR Smart Battery Case also costs $179 CAD and is also available in White and Black. The cases are currently available online through the Apple Store with delivery listed between January 25th and February 1st in Canada. In-store sale of the Smart Battery Case is set to launch on February 1st.